Bicon have developed a new surface process, NanoTite™. A high-energy ion beam source aims a beam of ions at the surface of a target treated with HA. 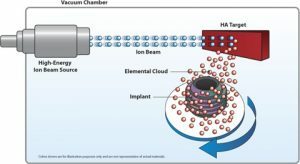 These high-energy ions eject the HA from the target/substrate and create a molecular cloud whose molecules bond with the surface of the Bicon Ti 6Al-4V ELI implant. This Ion-Beam Assisted Deposition process, which provides increased integration with the implant surface, is known as High-Energy Sputter Deposition. Using an Ion-Beam Assisted Deposition process, the titanium alloy is modified with a thin (less than 1 micrometer) amorphous calcium phosphate compound with HA-like chemistry and physical properties for enhancement of bone integration.